The climax of the 2014 Formula 1 season in Abu Dhabi can be followed live across the BBC on TV, radio and online. The final instalment of the 19-race campaign at the Yas Marina Circuit will decide the drivers' title after a gruelling nine-month duel between Mercedes duo Lewis Hamilton and Nico Rosberg. The Abu Dhabi Grand Prix will be broadcast live on BBC TV, while there will be full live coverage on radio and online, including audio and text commentary. You can get race results alerts from the BBC Sport app, meaning you get the results as they happen. Live text, TV and radio coverage available online for all on-track sessions. For all live races, coverage will be live on BBC television, radio, online and red button. For non-live TV races, there will be live radio and online text commentary with video highlights on television, online, red button. Audiences can access the BBC's digital coverage from any device through the BBC Sport website, and via the BBC Sport apps for mobiles, tablets, and connected TVs. 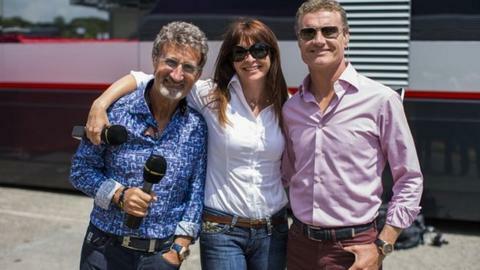 This year, the BBC F1 TV team will once again be led by presenter Suzi Perry alongside chief analyst Eddie Jordan, co-commentator and pundit David Coulthard, analyst Allan McNish, commentator Ben Edwards and pit-lane reporters Lee McKenzie and Tom Clarkson. Joining the TV team to make an occasional series of films will be former Red Bull driver Mark Webber. The Australian will be looking at stories within Formula 1 from his unique perspective. - All races and qualifying sessions that start before 10:00 to have full repeat on terrestrial TV later in the day. For qualifying, there will be extended highlights on BBC One and BBC One HD on Saturdays at approximately 17:30 for European time zone races, approximately 13:00 for early morning races and 22:30 for evening races. For all races live on TV, all qualifying and race on-track sessions will be streamed live on the BBC Red Button with the interactive forum on Red Button and the BBC Sport website for an hour after each live BBC race. There will be live streams on Connected TV of all of the live BBC TV races with alternative options including driver tracker, pit lane and on-board camera. Online will also offer viewers additional video streams, plus extensive video highlights, interviews, race reports, features and analysis from every race of the season. Click here for further coverage details. BBC Radio 5 live will again be providing extensive coverage and live commentary of the on-track action - on 5 live on 909 and 693 MW and BBC 5 live sports extra on digital radio. F1 correspondent and commentator James Allen leads the coverage with Allan McNish as co-commentator and pit-lane reporter Jennie Gow. Commentator Jack Nicholls will also join the team for four races on BBC Radio 5 live and 5 live sports extra. Audiences can listen to every grand prix of the season on Radio 5 live or 5 live sports extra, and most practice and qualifying sessions. Every race weekend starts on a Thursday night on Radio 5 live with the Formula 1 preview show. The Chequered Flag podcast, wrapping up all the action, is available to download following each race weekend. You can listen to Radio 5 live and 5 live sports extra via the BBC Sport website, the BBC Sport app and the BBC iPlayer Radio app. Details of BBC Radio 5 live coverage. The BBC Sport website will carry all BBC One, BBC Two and red button coverage of F1 and. for the races that are live on the BBC, there will be multiple live video streaming. Video will be available in high quality, enabling viewers to watch on desktop and mobile, as well as through the BBC Sport app. The website will continue its distinctive live text commentary, as well live Radio 5 live audio commentary of every moment of practice sessions, qualifying and races. In addition, chief F1 writer Andrew Benson will bring the best stories from inside F1 with news, interviews, analysis and comment. Allan McNish will give the lowdown on the cars and the teams throughout the week and the racing weekend and Suzi Perry will bring you the colour and insight from behind the scenes of F1. If you have any questions about the BBC's F1 coverage please first consult our main FAQs page. Coverage will be supported through the range of BBC social media platforms, which are followed by millions of fans in the UK and across the globe. This season sees a dedicated Formula 1 Twitter account from BBC Sport, @bbcf1, which will provide the latest news and behind-the-scenes coverage from across output. Fans will also be able to have their say on key race incidents through online and Twitter hashtag votes. in addition, the BBC Sport Facebook and BBC Sport Google+ page will extensively cover every race, while the BBC Sport Instagram account will showcase the best behind-the-scenes photos from the BBC's Formula 1 team.